Another Somewhere is a half homestead region of delight. Created by Azriel Xue, it is another reminder that it doesn’t necessarily require a 15,000 prim land capacity to create something eye-catching and memorable (or even 3,750 for that matter). Wilderness is the theme here; rugged cliffs, perhaps leading up to mountains tall and cold, stand over a stretch of coastline hugged by blue waters which surround three nearby islands. These can be reached by boat, and are in turn watched over by larger islands further out to sea (off-sim). Footpaths follow the shoreline, winding their way around the base of the cliffs and overlooking the water, before branching to climb steps worn into the rock and then branching again. Little red huts stand over the waters, precariously balanced on wooden piers out-thrust from the sheer rocky faces. Part of the water passage between coast ansd islands has been dammed, squared-off stone bricks allowing a path to reach the largest of the islands. 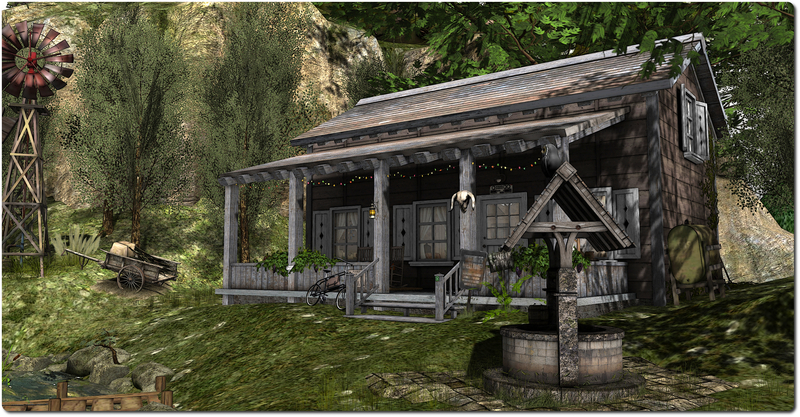 Here sits a rustic cabin, offering home comforts and fresh water from deep well. An improvised jetty of old railway sleepers offers a place where you can grab a motorboat and make your way to the other islands (although I confess, the rezzer didn’t want to work for me 😦 ). The outermost of the remaining two islands offers a place to sit out with friends under leafy shade, enjoying a cup of coffee or a bowl of what looks to be chowder, both simmering over an open fit pit. 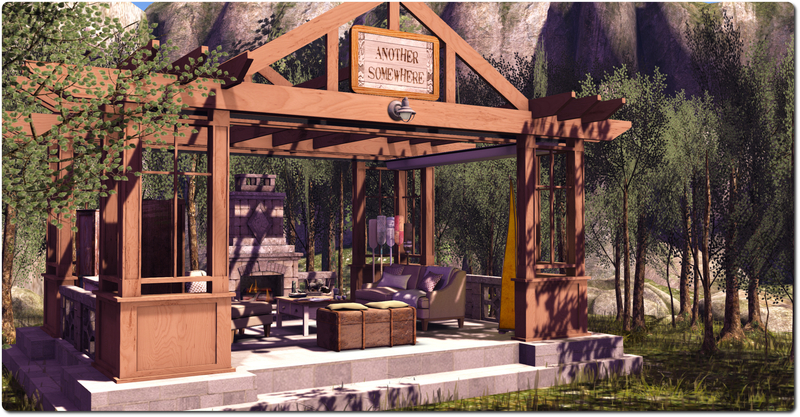 A gazebo offers a warm fire and place to sit sheltered from any wind, for those who prefer. 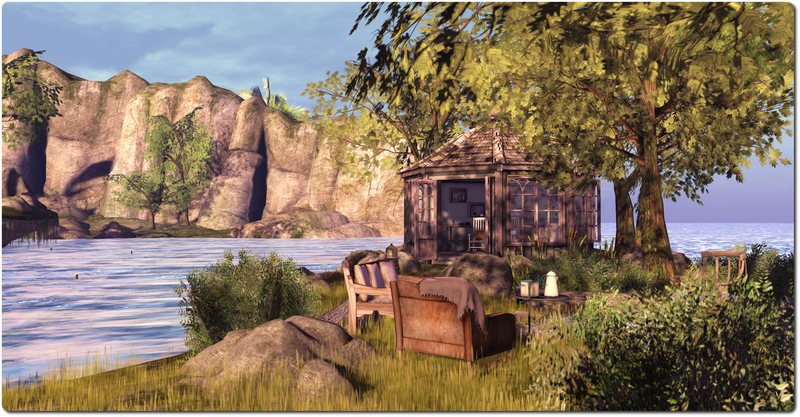 Across the water, you can follow the paths upwards, where there is more to discover: one leads to a look-out point, another gives access to an old mountain shelter, now perhaps serving as a hunting lodge. 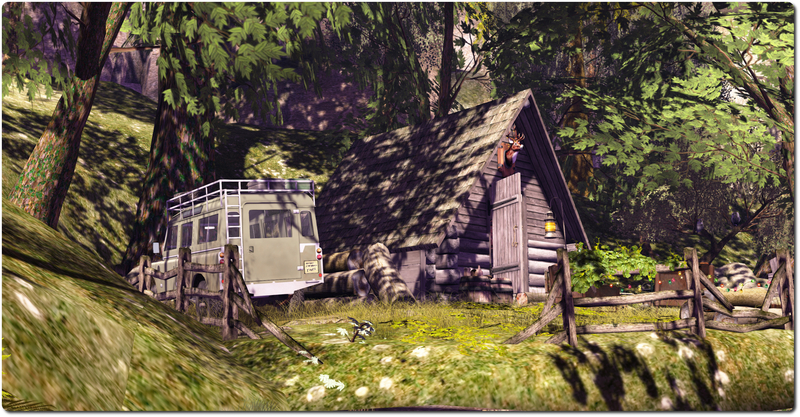 Follow a follow a third, and it will take you into the foothills and to a high wooden footbridge spanning the gorge between the cliffs and the rocky outcrop sheltering the cabin. 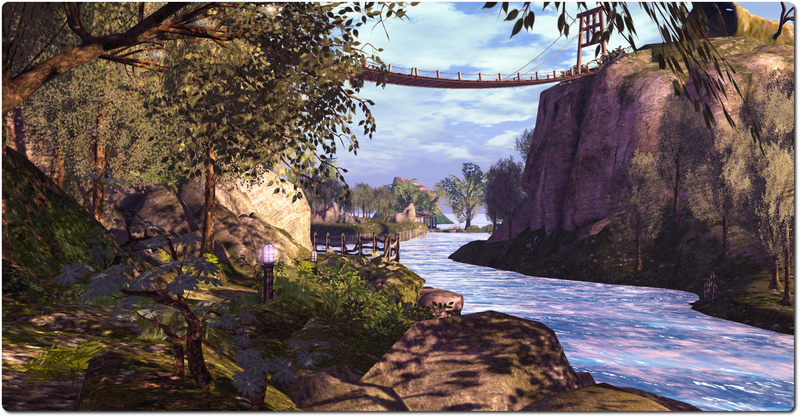 For SL photographers and those seeking new places in SL to enjoy, Another Somewhere presernts itself as an excellent place to visit. I also have to admit to liking Azriel’s outlook on life, summed up in a quote from Lauren Myracle: I live in my own little world. But its ok, they know me here. I know that feeling ony too well!